When Commissioner Gordon had a problem too big to solve, he used the Bat Phone to summon help; now, advertisers in desperate need of a creative solution can turn to its 21st century equivalent, The Garden Gnome. 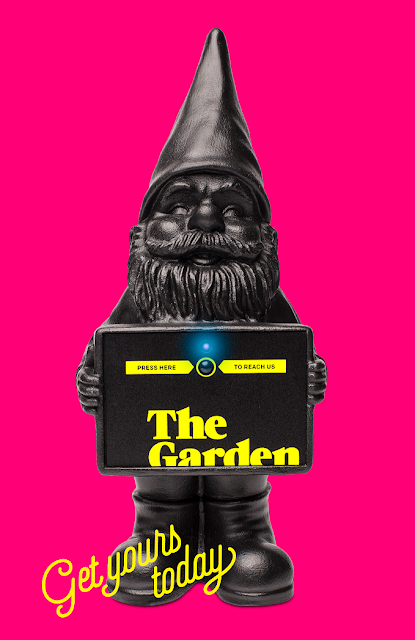 Toronto creative shop The Garden has introduced a gnome capable of providing relief for prospective clients in distress. With a simple push of a button, the 12 inch tall gnome immediately sends out a distress signal (actually an e-mail) to The Garden’s managing director, Dic Dickerson. “We wanted to do something that would not only capture attention, but demonstrate our ability to play in the world of digital and tech,” says The Garden’s co-founder Shane Ogilvie of the company’s newest client recruitment tool. Each gnome is created on an as-needed basis using 3D printing technology – although they have the heft and appearance of the ceramic gnomes that have dotted gardens around the world since the 1800s. Each gnome uses proprietary chip-based technology – no wi-fi or Bluetooth connection required – to connect prospective clients with the agency at the touch of a button. The Garden is promoting the gnome via a dedicated website featuring a faux infomercial starring Dickerson. Complete with the 80s TV-style washed-out look, the 90-second video shows Dickerson suggestively posing with the gnome, wooing potential clients. The initiative reflects The Garden’s mandate as a project-based company – it has completed more than 150 projects in its two-year history – rather than one relying on AOR relationships, says Ogilvie. “We prefer to be a client’s ‘Agency of Preference’” he explains “We’re there when you need us, but not paying for us when you don’t. Plus, it forces us to try harder, because we know we’re only ever as good as our last project”.